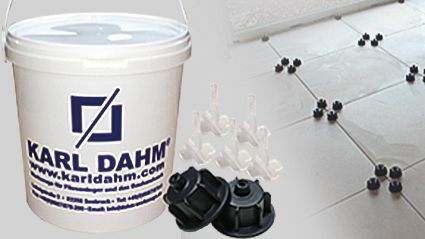 Grouting of tiles and many more, with grouting guns, grouting machines, sponge boards, silicone tools from Karl Dahm. 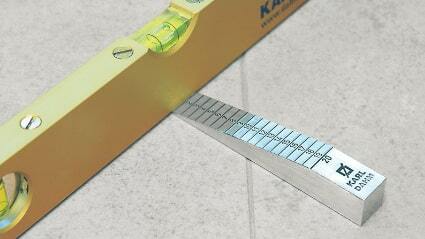 If you wish to create clean and optically perfect joints you will definitely need professional tools for grouting. In any stage of the work, beginning with jointing and ending with washing the tiled surface, professional tools will help to make work easier. 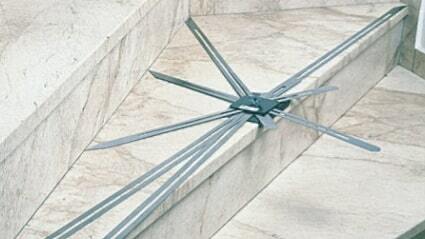 Therefore fatigue-proof jointing and grouting is very important. Grout floats with an ergonomic skid-proof softgrip handle fit the hand nicely even when damp. 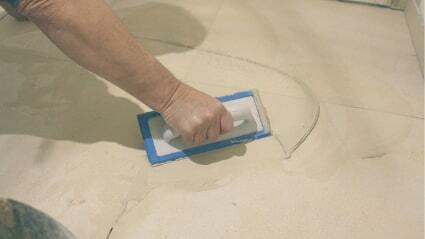 Foam rubber facings guarantee a clean filling of the joints and allow for quicker and proper grouting. 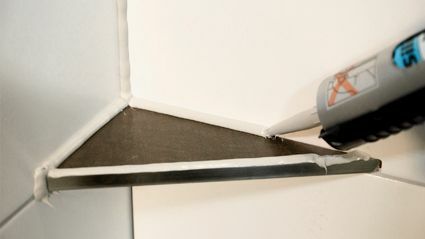 The professional rubber grout float helps to create compact joints respectively to make joint compounds firm and durable. Compared to conventional foam rubber grout floats the very flexible and smooth rubber of the professional rubber grout float helps to apply jointing mortar much better. Orginally made for applying epoxy jointing compounds in swimming pools this professional rubber grout float can spare ceramic tilers the work of washing after grouting. For the applications of jointing and washing it is advisable to use a washset. Some washsets are supplied including a grid others come without grid. Sponges are easier to squeeze when you use a grid. Rollers for squeezing out sponges are attached to the bucket. 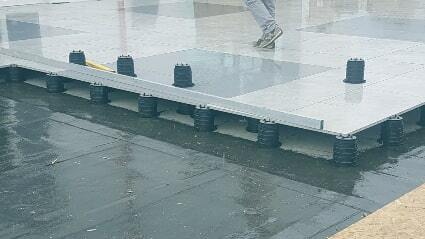 These rollers are made from hard-wearing plastics. Ball bearing rollers will last for years and years. In order to prevent dirty water from running down the bucket these squeezing rollers are often flush with the bucket. Disposable bags are available for the sake of the environment. The bags containing the sediment that deposits on the bottom can be disposed together with other construction debris. Hydro sponges or hydro sponges with handle are well suited for cleaning after grouting. They absorb water , cement clurry and grouting material well. The open cell structure of the material allows for easy squeezing and cleaning the sponges. A Hydro sponge is very similar to the valuable natural sponges and concerning its washing properties even superior to other sponges. When grouting large areas mechanical grouting becomes more and more usual. As already mentioned grouting of large areas is most of the time done by using grouting machines. Squeegees are used to spread the cement slurry. It is very important to avoid bubble formation during grouting. Then grouting material is spread over the area with a so-called floor grouting machine equipped with a multi-disk plate for grouting. 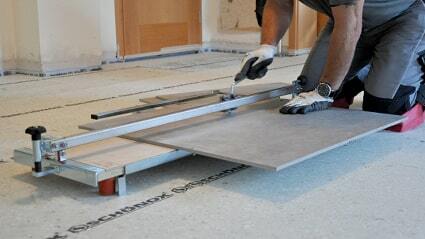 For larger areas the use of a grouting and jointing machine will save you a lot of working time. 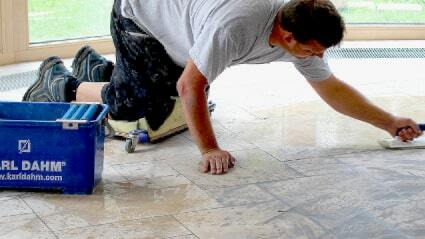 Grouting in a standing-up position will make work much easier and will protect back and knees. 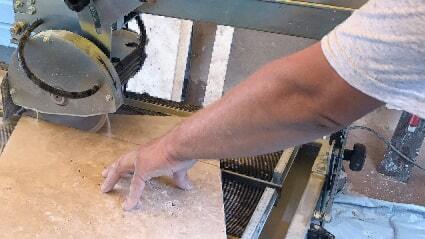 Interior and exterior grouts – both are necessary to create a nice and durable grouting. Furthermore the grout prevents joints from getting too dirty over the years. Please make sure that the grout material is not too wet during grouting. These days there are the most different types of grout material. 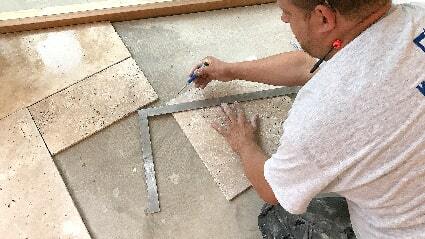 When grouting and working with these materials it is very important to follow the manufacturer’s instructions. When doing silicone joints the use of a caulking gun is very helpful. Grouting can be done manually or mechanically using an electric caulking gun.